A friendship ceremony, “We Are One,” opened at the intersection of Florence and Normandie in South Central L.A.. While the Shatto Recreation Center & Park hosted a boxing match to commemorate harmony. Twenty-two years after the April 29 L.A. Riots, events celebrating harmony between Korean and other ethnic communities took place at the origins of controversy on Saturday. A friendship ceremony, “We Are One,” opened at the intersection of Florence and Normandie in South Central L.A., while the Shatto Recreation Center & Park hosted a boxing match to commemorate harmony. 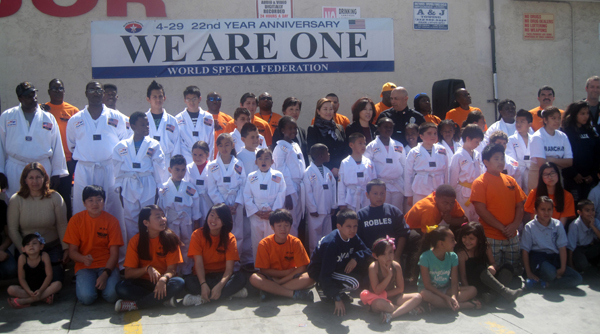 Hosted by World Special Federation and supported by the Los Angeles Police Department, “We Are One” drew a diverse set of about 100 people. They joined together in singing the national anthem, saw a children’s taekwondo demonstration and participated in volunteer efforts to clean the streets. WSF President Kim Soon-im said the event was organized as a mission to grow the seeds of healing and unity in the years after the riots took place. 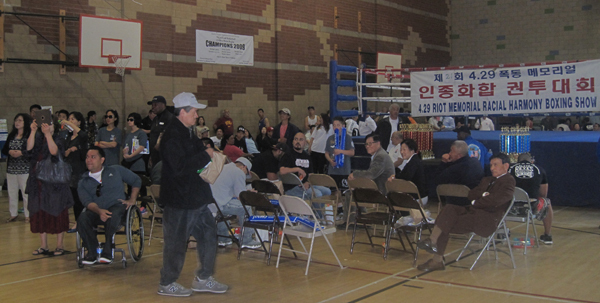 In Koreatown, the Korean American Boxing Federation put on a boxing event with the support of the L.A. Korean Consulate General and the Cultural Center. A diverse set of young people participated in the tournament, and a Korean line dance team performed. Korean-style lunches were provided for attendees. Daniel Jung, president of the boxing federation, said the tournament is in its 21st year and that it is an opportunity for all communities in L.A. to celebrate and learn the importance of friendship.